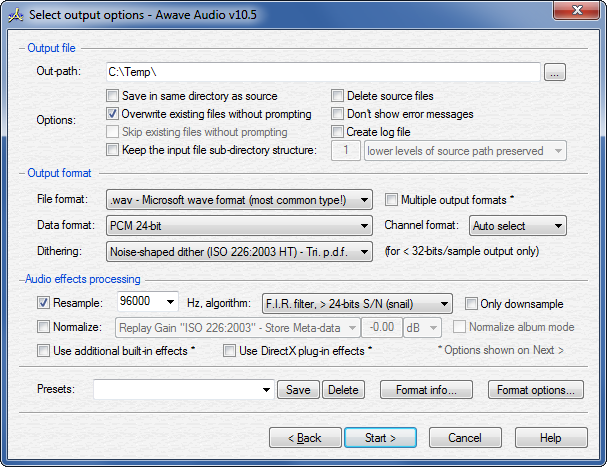 Awave Audio is an audio file format batch converter. Awave Audio Features include: Support for about 90 audio file formats. Optional effects processing using built in effects and DirectX plug-ins. Professional noise shaped dithering. State of the art sample rate conversion (resampling) options. Optional psycho-acoustical corrected volume normalization. 24-bit multi-channel audio supported. And much more! Awave Audio is an audio File Format Batch Converter software. - Handles many types of text meta-data tags - with full Unicode support. Qweas is providing links to Awave Audio 10.5 as a courtesy, and makes no representations regarding Awave Audio or any other applications or any information related thereto. Any questions, complaints or claims regarding this application Awave Audio 10.5 must be directed to the appropriate software vendor. You may click the publisher link of Awave Audio on the top of this page to get more details about the vendor.